In March 2009 Bobbie Short (www.bigfootencounters.com) had received from Canadian citizen Randy Brisson photographs with the first images of sasquatch made in this province. 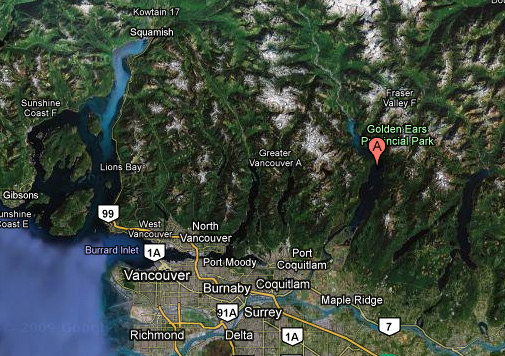 The place where they were shot is approximately 150 miles from Vancouver at Golden Ears Park. In the photos the head similar to that of a human was visible from beside of broken large thumb of a tree. These pictures were presented in the Web where they have caused waves of the most opposite opinions. Let us look at them thoroughly now. The first picture was presented by №407. Then the photographer came a little near to the thumb. He made some steps forward to it and to right side as it is seen with changed positions of trees. Here he made the second shot. As Randy Brisson tells, after that the figure behind the stub had bent down and quickly left the place, disappearing behind it. Some people said that those are the forgeries executed with help of Photoshop. Others found in them realistic features. The strange persons appeared in that area with weapons, intending to kill the creature. For Randy and his son Ray hard times of attacks and insults came. Careful examination shows that the visible head in the photos is mobile, live, not stamped into picture. By computer processing I have received zoomed images of the head for both shots, and no point was inserted into the images by me manually. Use of gray scale in below row allows to reveal in this case such details which disappear in color mode. The gray images were also considerably light. We see that this creature has face of the form which can be met among humans. Its skin is very dark. The face has considerable cheekbones protruding sideways. There is visible transition from them to upper cranium. Hair on the face falls from cheekbones, covering the low part of it. Possible prognathism is not seen, because the face looks directly to camera. The hair on the head seems to be slightly wavy (or confused), it does not hang down. The forehead is not high. The first, 407, image shows that the creature may feel some worried. His mouth is slightly opened. His eyes are directed to the right side from the photographer. In the second image the mouth is wider, like in smile. He looks to the left and downwards. Obviously, the creature is observing to movements of the man and around him. 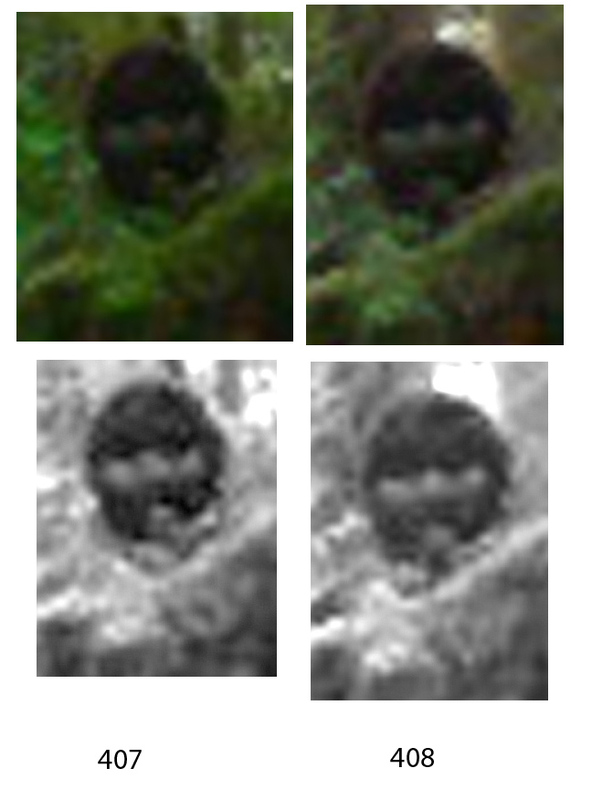 The head in these images is considerably different from what one can see in Patterson-Gimlin footage. In P-G movie head of creature (Patty) shows some anthropoid features. Images by Brisson bear characteristics close to modern human. If sometime it will be found out that Brisson's imagesit represent, nevertheless, real hominoid-bigfoot, it will be necessary to recognize that some different hominoid populations, probably different species, live in the Northern America. Certainly, with these images only there is no impossibility to deny a man behind the stub. For example, it may be the local with strange behavior (to look out and disappear). In my opinion, his face has features that are common to some people of the Mongolian race. I do not know, whether American Indian tribes or other people there have similar anthropological type. In such circumstances it is necessary to take into consideration the faithfulness of the observer. According to researcher Bobbie Short who is familiar for a long time with the father and son Brisson, they deserve full confidence. Without looking for sensations, they some years trace family of Bigfoots, that include a child. Their findings are presented in the Web. In turn, according to stories by Brisson, these creatures trust them also. So, this mutual trust allowed to make these exclusive images. 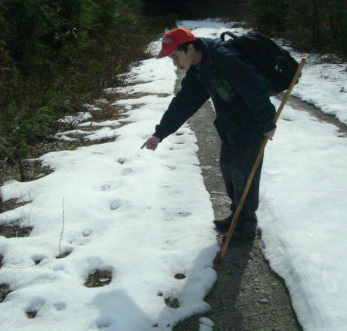 Ray Brisson shows footsteps of a Sasquatch child, found out in February 2009. I consider that photos by Randy Brisson are not fakes and deserve serious investigation.